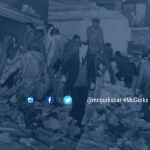 For over 10 years, the families have asked police investigators where was the British Army’s death-squad, MRF, when McGurk’s Bar was bombed. Every investigation by the police and Police Ombudsman’s Office in the 46 years since the atrocity, which claimed the lives of 15 civilians, have failed to even prove the existence of the Miltary Reaction Force (MRF) at the time never mind locate its active service units around Belfast on the night of the bombing. Nevertheless, the archive discoveries below prove the covert unit’s existence at the time and even locate it operating in the areas surrounding McGurk’s Bar. Paper Trail can now prove that the MRF operated with the resident 2nd Battalion Royal Regiment of Fusiliers (2RRF) which attended the scene of the massacre in its immediate aftermath. 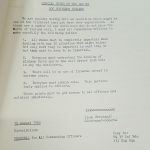 The archives evidence, in fact, that the MRF was active in the area the day and night before the attack but is absent from 39 Brigade Operations Logs on the day of the bombing. Therefore, the families have been correct all along to query where was the MRF when their loved ones were killed as they have questioned whether its operatives were involved either directly or through agents it ran within the UVF paramilitary bomb team. Successive investigations by the British state up to the present day have either failed to locate the MRF in North Belfast at this time or have hidden the information from the families. Instead, it has been left to a grandson of two of the victims to prove that the MRF operated with the British Army battalion resident in the area which re-emphasizes the importance of the families’ question: where was MRF when McGurk’s Bar was bombed? The Military Reaction Force (MRF) was a clandestine British military unit deployed on the streets of Belfast when counter-insurgency expert General Sir Frank Kitson was the Brigadier in charge of 39 Airportable Brigade covering Belfast and Greater Belfast in 1971. The MRF’s role in simple military terms was two-fold: (1) covert intelligence-gathering and agent handling (reconnaissance); (2) armed contact (reaction). Another is quoted by the British state’s broadcaster that the MRF was quite simply “a legalised death squad” (BBC link). Many of these deaths are now supposed to feature in an investigation into the MRF’s killings by the Police Service of Northern Ireland (PSNI) but many families are not hopeful that the police will do a proper investigation as PSNI lacks proper independence to investigate killings during the conflict, especially those perpetrated by the state. New Lodge witnesses record a heavy British military presence at vehicle checkpoints (VCP) throughout the morning and day of the McGurk’s Bar bombing due mainly to the embarrassing escape of 3 Republican prisoners from nearby Crumlin Road Jail on the 2nd December. Nevertheless, every police investigation up until the present day disputed the strength of these operations even though they were also reported in the media of the day. Nevertheless, these documents record the heightened security operation from early in the morning and they were so tight that 2RRF reported congestion at 805am caused by the VCP on the Shore Road. Considering it was a Saturday morning and there were relatively fewer car owners in 1971, this tells us just how tight security from early morning on 4th December 1971. The logs prove that the MRF was actually attached and reported to the 2nd Battalion of the Royal Regiment of Fusiliers (2RRF) which was deployed from October 1971 to February 1972 in the New Lodge, Unity and City Centre areas of North Belfast. The logs record that the MRF was operating covertly with 2RRF in the vicinity on the day and night before the McGurk’s Bar bombing but disappear from the logs on the day of the attack. Just after the McGurk’s Bar bombing, a special British Army mobile units with signal codes 04 was deployed to the area, along with a detachment from 1st Battalion of Parachute Regiment (1 PARA) which housed the MRF at Palace Barracks. At 1050pm 2RRF reports that “04 is on Antrim Road between Carlisle Circus and Duncairn Gdns”. Then, at 1055pm 2RRF reports “04 arriving in 5 mins”. Then, at 1105pm 1 PARA reports “B1 on its way to Unity now. ACTION Told to come onto 2RRF net”. It is unclear from the files whether 04 was specifically MRF or a rapid reaction mobile unit from another regiment. The redacted information in the files may give the families that evidence which is why the families have raised a complaint with the British Ministry of Defence to access the remainder. (1) Ciarán MacAirt, Project Manager of Paper Trail, is a grandson of John and Kathleen Irvine. Kathleen was killed in the McGurk’s Bar attack and John was badly injured. Ciarán targeted the file in the National Archives, London. 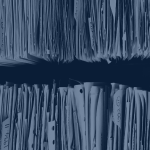 Part of the file was released to him after a year-long battle under Freedom of Information, although potentially significant evidence was withheld following a British Ministry of Defence Public Interest Test. He immediately lodged a complaint with the National Archives and British Ministry of Defence for access to the remaining information relating to the murder of his grandmother and the 14 other civilians. According to book killing for Britain, UVF member Trevor Wilson alias John Black was present in North Belfast on the nights leading up to McGurks with his handler Mike, who he claimed was from Palace Barracks where they trained together.Mike he said was MRF and I’ve now discovered he was Mike Norman, British Soldier and marksman , gave evidence at bloody Sunday.Mike said something big was going down in the book as far as I recall. Thanks, Joseph. Wilson and Norman are indeed people of interest for the period. Well noted.